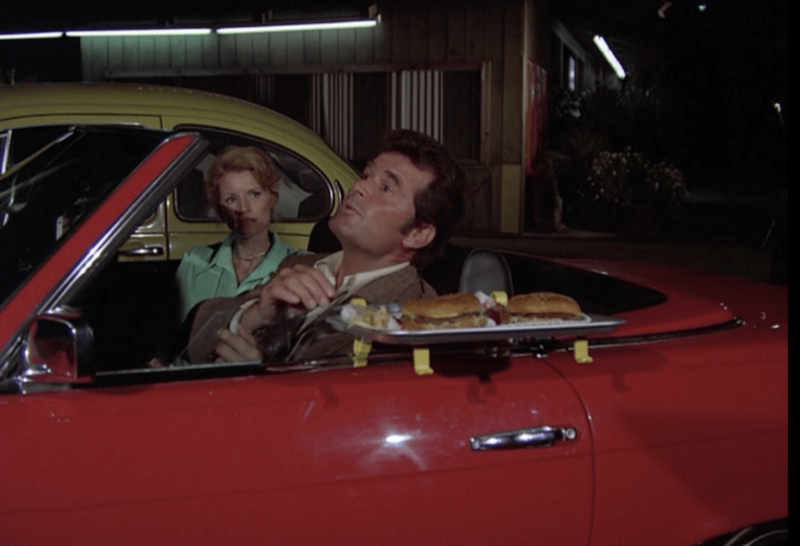 So began the Rockford Files’ premier episode, which debuted before American TV audiences on Sept. 13, 1974, Day 34 of the Gerald Ford presidency. Witty answering machine messages at the start of every episode, and a brand new message each week. A Grammy winning Top-40 theme song catchy enough to cheer you up even in heavy traffic. In the 70s, you found your moments where you could, and you were happy to get them. 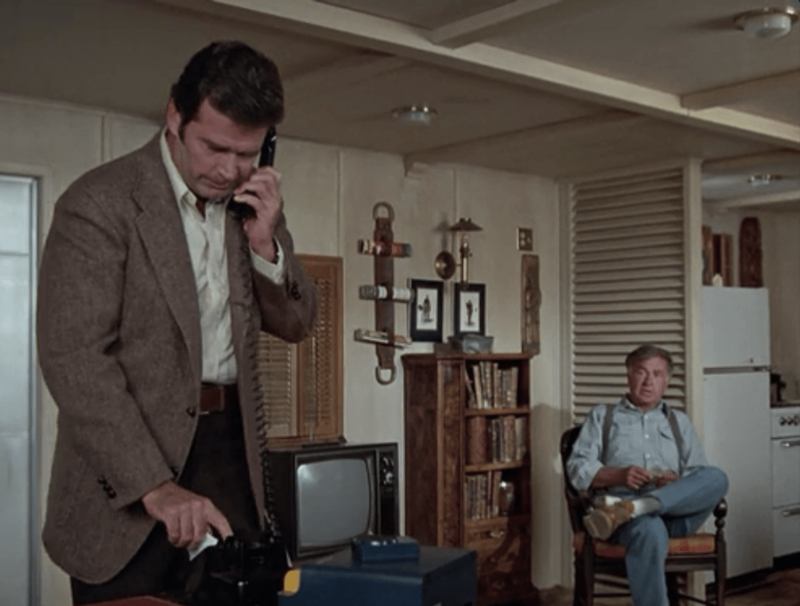 I wonder if anyone has looked at the numbers to see just how much demand for telephone answering machines spiked after the Rockford Files went on the air. I’m guessing it went off the charts. 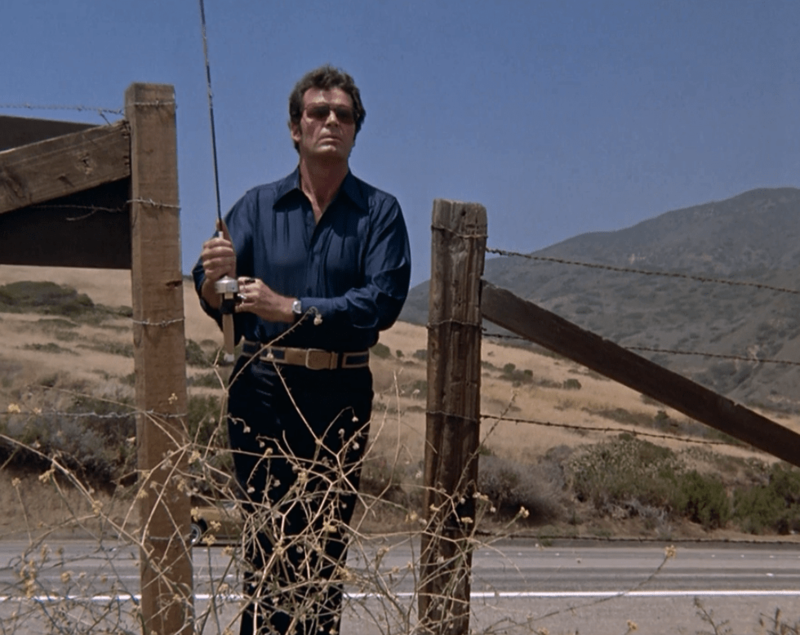 Whereas the Rockford pilot kicked off with 90-seconds of aerial jazz meditation on the physical geography of the California Coast, this episode starts with a carousel-sounding reprise of the theme song and Jim driving the four-lane blacktop of the Pacific Coast Highway in light traffic near what appears to be Leo Carrillo Beach, a stretch of coastal preserve that can easily make you forget you’re still in L.A. County. Jim heads to the beach. Of course, just as in the pilot, we are soon drawn down to the white sand and roaring surf. 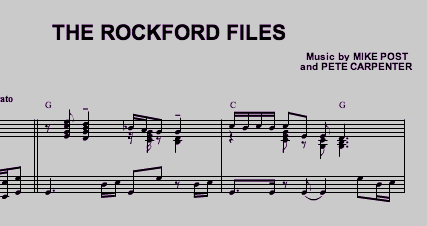 The music stops dead and a whole array of strange circumstances unfolds that leads to Rockford waking up on an unfamiliar couch, minus his pants. The femme fatale of this episode (Julie Sommars) is a woman of mystery, which is to say I’ve never heard of her before. She’s kind of got the Mia Farrow thing going on, and she knows a thing or two about fishing poles. First encounter with the femme fatale. Second encounter with the femme fatale. James Woods is Larry Kirkoff. 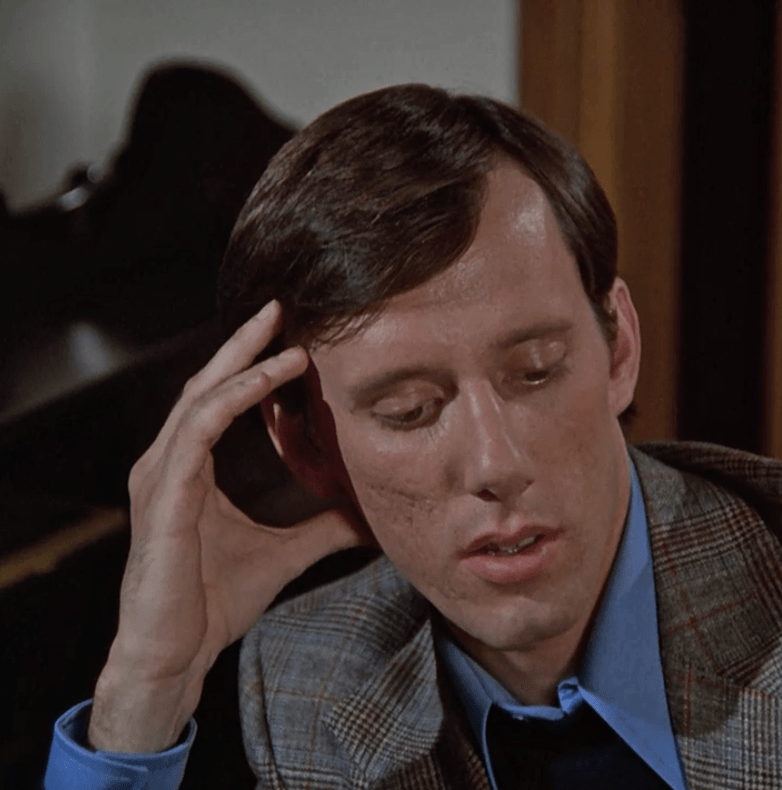 Larry Kirkoff turns out to be a very young James Woods, who receives Rockford in a stunning lakeside mansion that until very recently belonged to his murdered parents. Third encounter with the femme fatale. The Mia Farrow look. 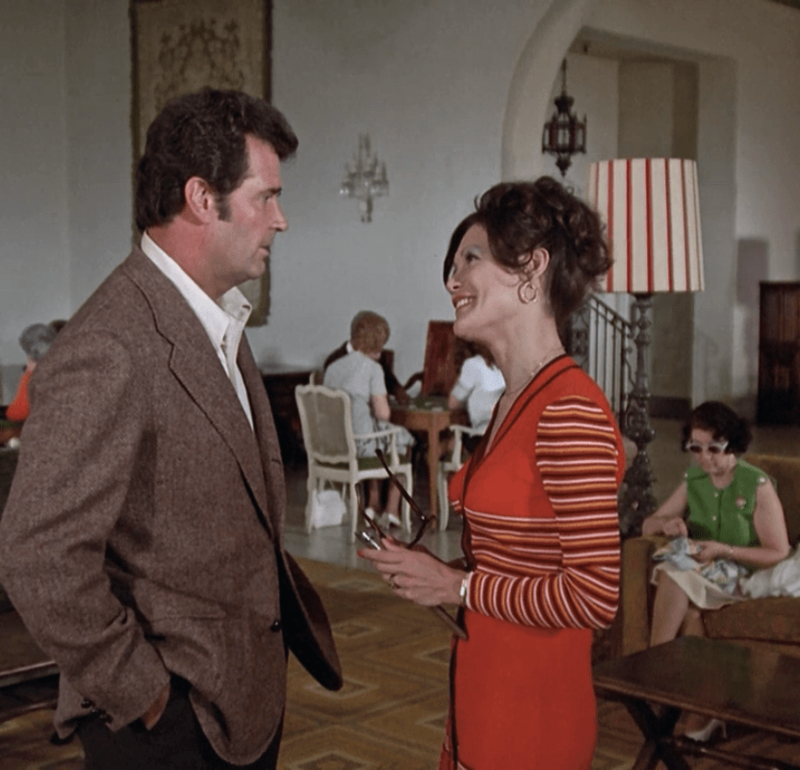 While on the case, Rockford uses his quick wit and fearless charm to infiltrate the swinging tennis club lunch scene, where he has his third encounter of the young day with this episode’s femme fatale. A dinner date is made. Rockford charms his way in. Inside the trailer, Rocky’s waiting for Jim. The back and forth between these two is flawless. 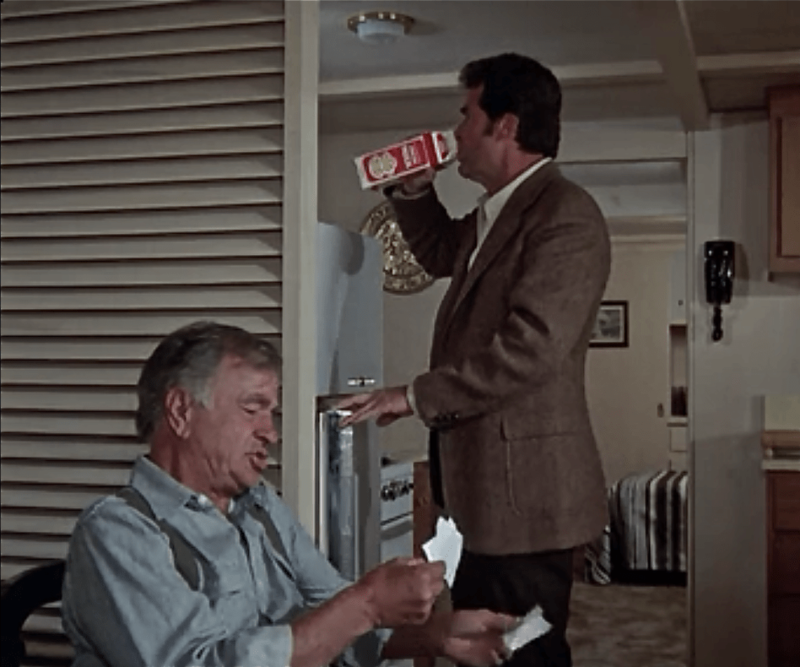 Noah Beery owns Rocky from his first line of dialogue. He’s a little like Nicholas Colasanto as “Coach” in Cheers, coming out of nowhere to take on a TV role later in life and hitting it out of the park. The Rocky we see in this first scene is the same Rocky we get to know so well throughout the show’s run. In some TV series, the characters develop and change over time. But Rocky, along with Dennis, Angel, and Beth (who has yet to be in a script) are all pretty much themselves from the get-go. Jim, too, needless to say. Jim’s trailer looks much nicer (and bigger) on the inside. 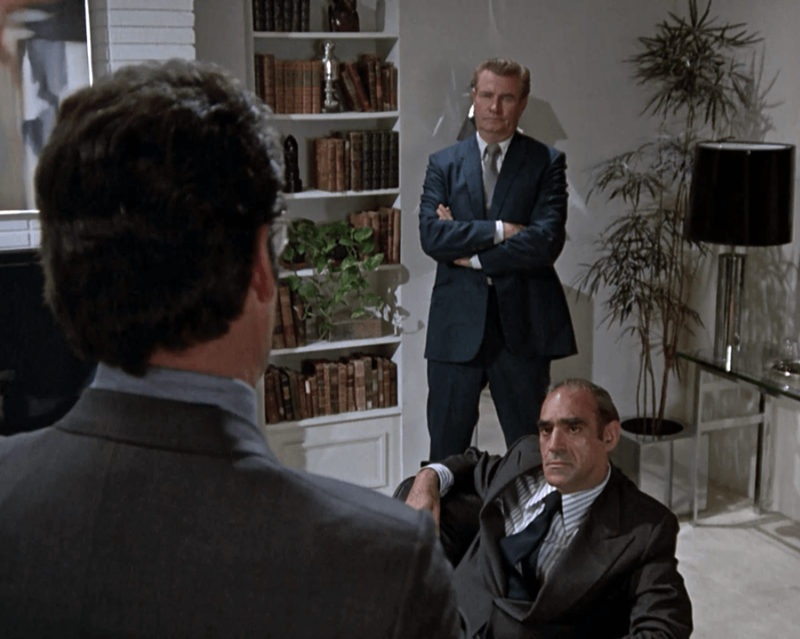 Over the course of the Kirkoff Case, Jim survives a poisoning and two beatings, but he finally gets through the door to see the capo de tutti capo, Don Abe Vigoda, (fresh off filming his cameo in “Godfather II”) and lives to tell about it. Jim and Abe Vigoda reach an understanding. 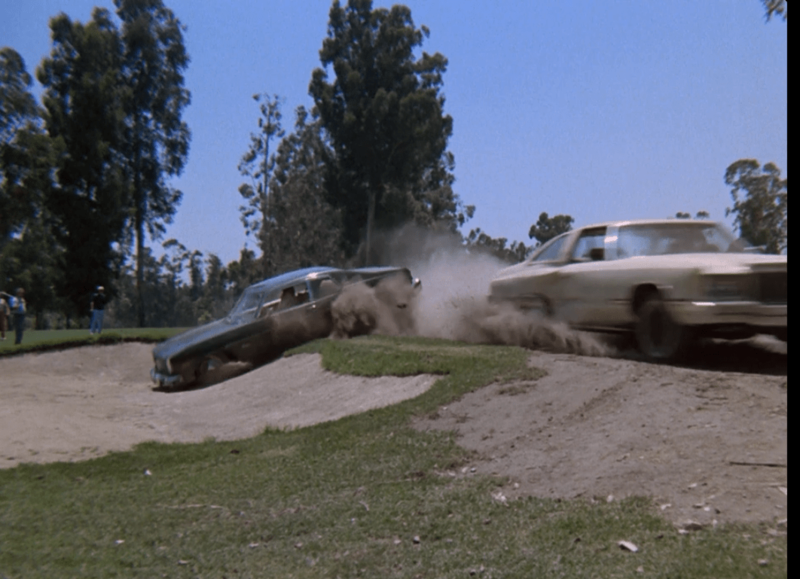 Rockford reaches an understanding with Don Vigoda, and soon afterwards, the episode’s high-speed car chase takes place across a golf course. That’s Jim in the tan sedan. Watch out for that sand trap, bro. 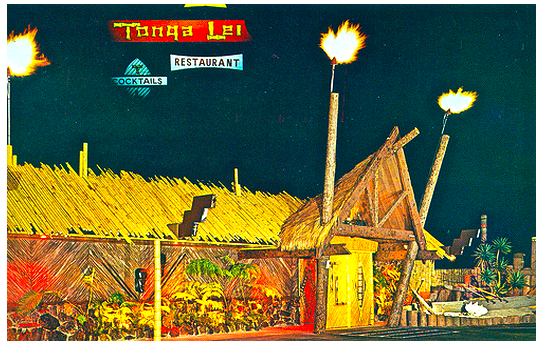 Postcard of the Tonga Lei. Tiki culture is a lost art whose heyday was half a century ago, but which will always linger on to be rediscovered by future generations, thanks to the devoted purists who keep the genre alive. Tiki culture is a lot like Seventies culture in that its basic aesthetics seem loud, brash, and out of place next to the rest of the 50s, 60s, and every other decade. But with its bold colors, fake grass, beaded curtains, and clunky kitsch, tiki culture seemed to reach equilibrium with society as a whole in the Seventies. Suburban, post-WWII America was a very buttoned down place, but the one venue where the crew-cuts had license to primp like peacocks was the tiki bar. This could be anything from a backyard patio to an Elks Club rec room, and it signified the place where the man in the grey flannel suit could relive the days of his youth with his army buddies, even bringing the missus along for mai-tais. 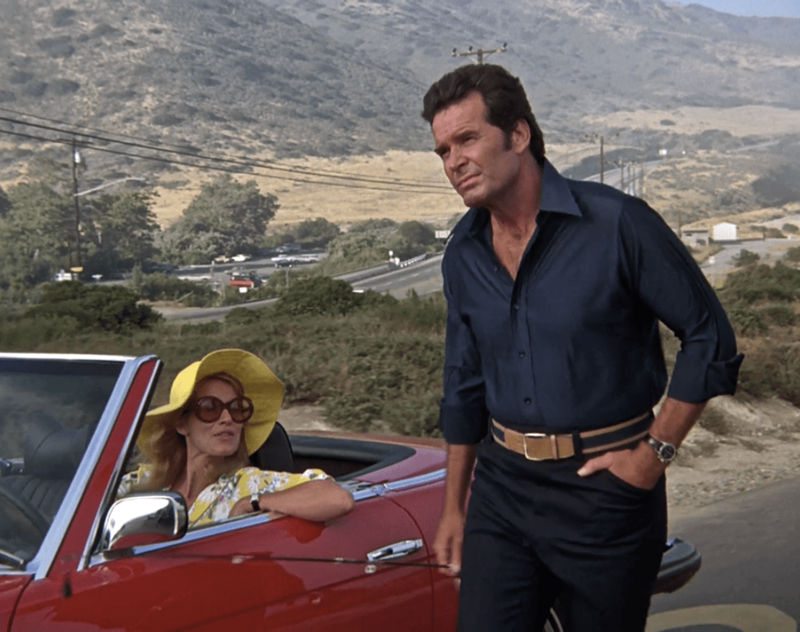 Jim Rockford was a Korean War vet, but he could get along in most circles. 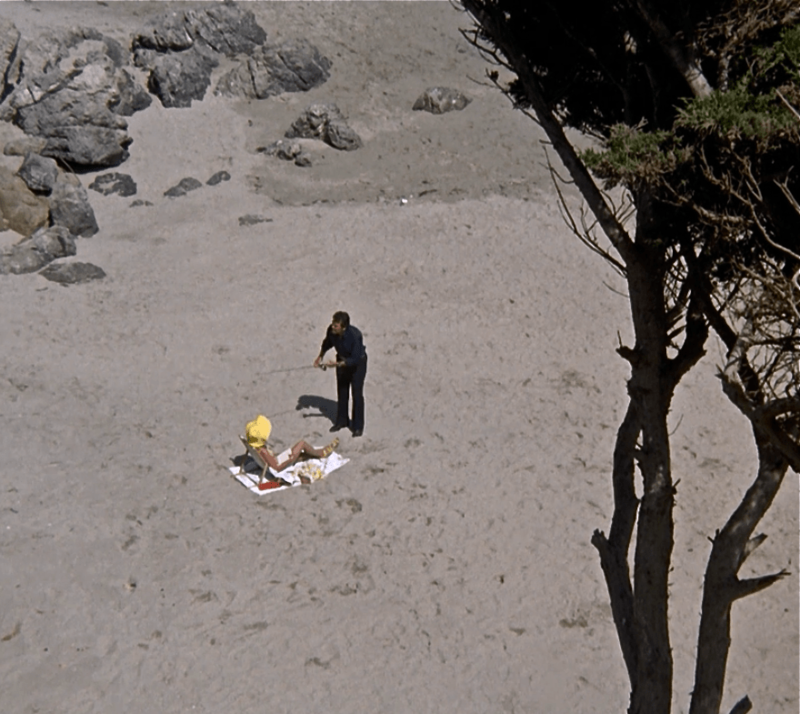 It’s hard to imagine Rocky hanging out with the hippies though. But it’s not at all hard to imagine Jim and Rocky walking over to the Tonga Lei any night of the week and closing it down with the bar staff. The private investigator who lived in a rusty trailer was fictional, but the Tonga Lei wasn’t. 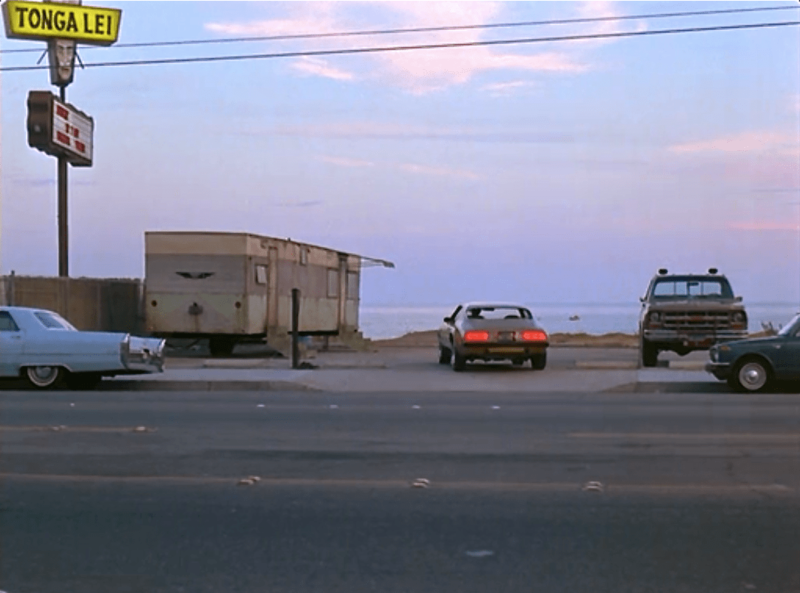 If not for archival footage like this episode’s establishing shot of Rockford’s trailer, we might forget it had even been there.